Jones & Boer Architects designs a breathtaking mansion, after a fire took hold of the site’s previous home, and show that craftsmanship and a sense of timelessness are still valued and achievable in today’s age. Photos by Maxwell MacKenzie unless otherwise noted. The bright and airy interior feels open and spacious. Photo courtesy Jones & Boer Architects. Positioned on a crest of the meandering historic Chain Bridge Road sits a speculative house. The road in particular connects Virginia and Washington, D.C., and existed long before the city&apos;s grid was established. Opposite the home is Battery Kemble Park, once a Civil War fort, now land administered by the National Park Service. Massive mature trees on the one-acre land provide seclusion from neighboring homes. The location&apos;s overall effect presents a sense both a balanced rural and urban environment. Not including the pool house, porticoes, and detached garage, the home is roughly 15,000-square feet and comprised of eight bedrooms, 11 full baths, and four half baths. It’s presence is moving and no surprise to why it was the 2017 John Russell Pope winner for New Construction over 5,000 square feet. The land first became available when a fire overtook the former home, along with its valuable private art collection. It destroyed everything in its path. Operating from a blank canvas, the developer desired to build a new home that that would match the beauty, majesty and splendor of the great mansions built in the city during the 1910s and 1920s. Something strong enough to stand as a testament to the local construction industry—that in today’s real estate market, beauty, craftsmanship, quality, and a sense of timelessness are still valued and attainable. A seasoned real estate agent wrote a full program envisioning the house could even accommodate major DC fundraising events. The house exudes an atmosphere comfortable enough for someone to feel relaxed despite the formal architectural setting. 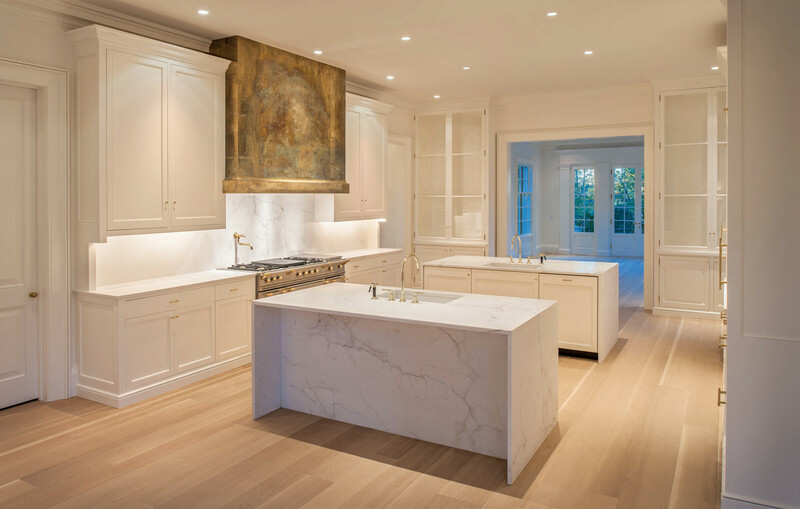 The kitchen was designed to function as a catering kitchen for large gatherings. With the developer’s objective in mind, to utilize as much of the one acre as possible, the architects elected to fashion a sense of an urban villa and arranged the house, hardscape, pool house and other features to emulate this. “The house is sited to take advantage of the long of street frontage, the goal was to spread the house out along the length of the street to allow for more generous garden spaces off the rear of the house,” says architect Wouter Boer, who designed the 5-part Regency styled stucco home, with a lower one-story garage and service wing. Architects from the 18th though 20th centuries—who produced stunning mansions—were carefully studied in particular for their scale, proportions and intricate details, predominantly the works of John Russell Pope and John Nash. Andrea Palladio&apos;s Doric Order, as documented in Parallel of the Classical Orders of Architecture, by Mauch and Normand, was chosen as the proportioning system for the exterior details. The architect meticulously designed moulding profiles throughout the home, taking great care to match the grand scale of the house itself. “Interior wood mouldings were custom designed, based on historical references, to complement the grand scale of house. A thoroughly contemporary home has been designed into this historical framework, including an energy-efficient geothermal heating and cooling system and extensive home automation systems,” says Boer. The architect meticulously designed moulding profiles throughout the space as well, taking great care to match the grand scale of the house itself. The kitchen’s grounded in tradition with a reduced color palette, bold proportions and symmetry. 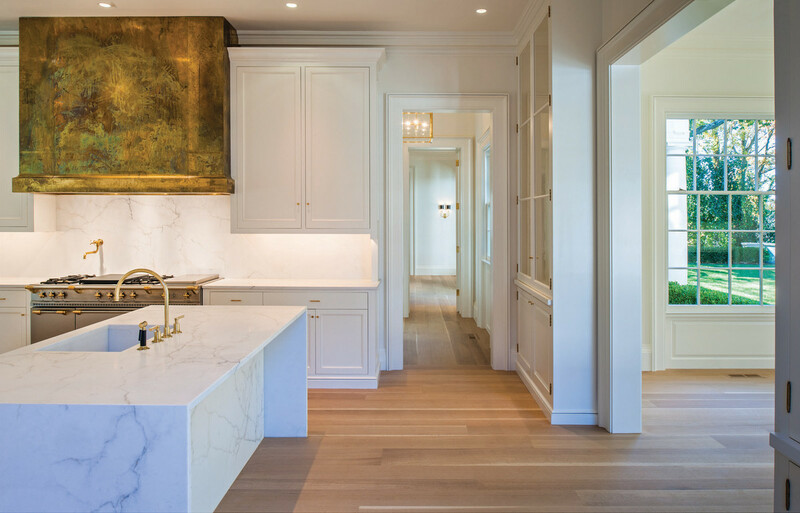 A sizeable range and bronze hood, intentionally left in its raw unfinished state, anchor the kitchen while the bespoke cabinetry is scaled to fit the 11 feet high ceiling. Designed to function as a catering kitchen for large Washington, DC gatherings, the room is grounded in tradition with its reduced color palette, symmetry, and bold proportions. Simple detailing polishes the look. The interior is bright and airy, judiciously created through the use of whites, simple bold proportions and light fumed wood floor planks. The hand carved mantel, in honed statutory marble, bodes well with the four 9-foot-tall French doors, transmitting ample natural light and offering abundant outdoor views. 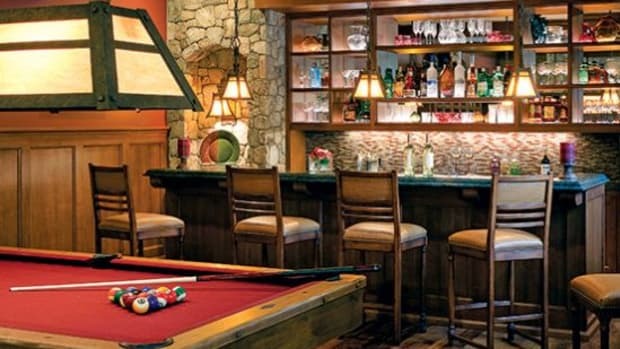 A mix of modern furniture cohabiting with more traditional architecture keeps the atmosphere crisp yet welcoming. Boer says it was important to keep the atmosphere comfortable enough for someone to feel relaxed despite the formal architectural setting. 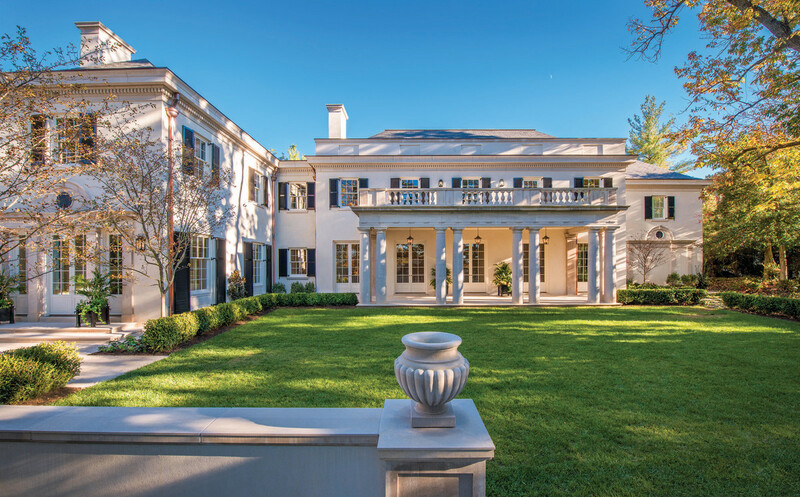 230 tons of Indiana Limestone were used to carve out the exterior details, including load bearing front and rear porticoes, blind arches, sills and terrace paving. “The exterior of the home is a careful study in proportion and scale, drawing on precedents from influential architects,” says Boer. 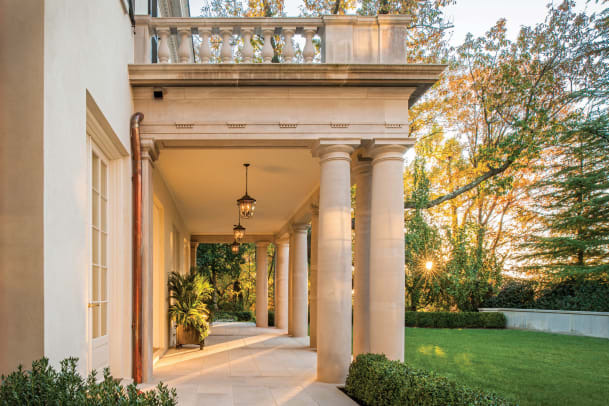 It took 230 tons of Indiana Limestone to carve out the exterior details, including load bearing front and rear porticoes, blind arches, sills and terrace paving. Other materials include stucco, slate, painted wood windows, all of which are characteristics of the Regency style. Architectural site plan for the grand home. 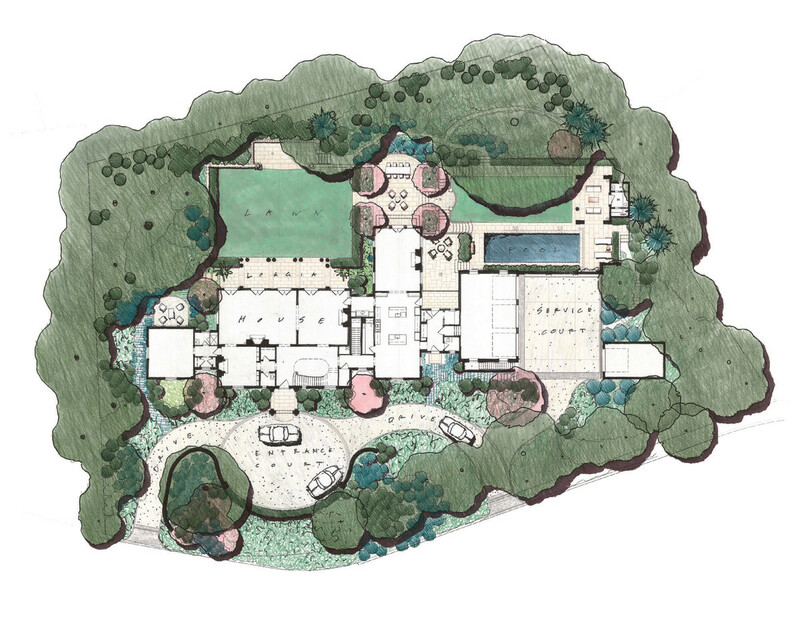 “A main axis in the rear is developed by connecting the main lawn area off the living/dining room with the family room terrace and steps down to the pool and lower lawn area, this main axis is terminated by the pool house which becomes a center piece of the lower lawn,” notes Boer. To welcome guests to the front entry portico, a large pea gravel oval, centered on the main block of the house, was created and defines the planting plan for the front of the lawn. Arentz Landscape Architects designed the landscaping.Colored rendering from Jones & Boer. Colored rendering from Jones & Boer. “The front and rear porticoes where inspired by works from Andrea Palladio and John Russell Pope. Close attention was given to detailing and proportioning the various stone pieces. Palladio Doric order was used as the bases for many of the exterior mouldings including both porticoes, the blind arches, main cornice and pool house,” says Boer. 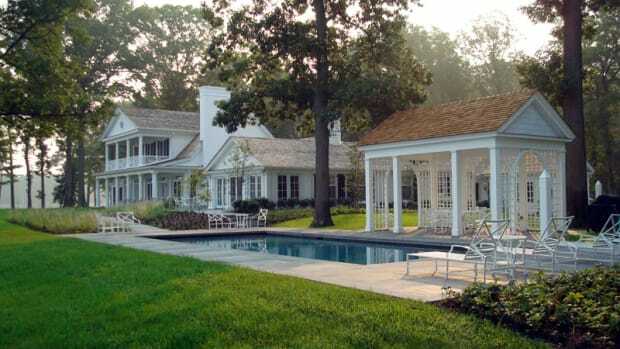 An award-winning residential architectural firm, and widely published in leading architecture and design magazines, Jones & Boer Architects is nationally acclaimed for designing timeless traditional and contemporary residences indicative of legacy and meaning and adapted to a sense of place. “Projects are grounded in an understanding of history, and realized with a focus on functionality and comfort,” says Boer. A staff of architects collaborates with David Jones and Wouter Boer from concept to completion, gently guiding each client through the process of early decision-making, design, construction drawings, builder selection, and contract administration. Jones’ remarkable background includes undergraduate and professional degrees from Princeton University, study at King’s College, Cambridge, and work with Washington’s Hartman-Cox Architects. While Boer’s is also impressive, he studied architecture in his native country of New Zealand, holds a professional degree from Notre Dame, and has taught in the University of Maryland’s graduate program. While the firm has most recently received the John Russell Pope Award for this Chain Bridge Road home, they’ve accepted over 22 additional design awards in the past decade, including 4 national Palladio Awards for new traditional houses.